9.45am – Memorial Service at the Cenotaph in Plymouth Road Garden of Remembrance, B97 4PX. 10.30am – Parade from the Palace Theatre to St Stephens Church. Those who wish to be in the parade should arrive no later than 10.15am and veterans in particular would be welcome. Once again this year Chelsea Pensioner Simon de Buisseret will be in attendance. 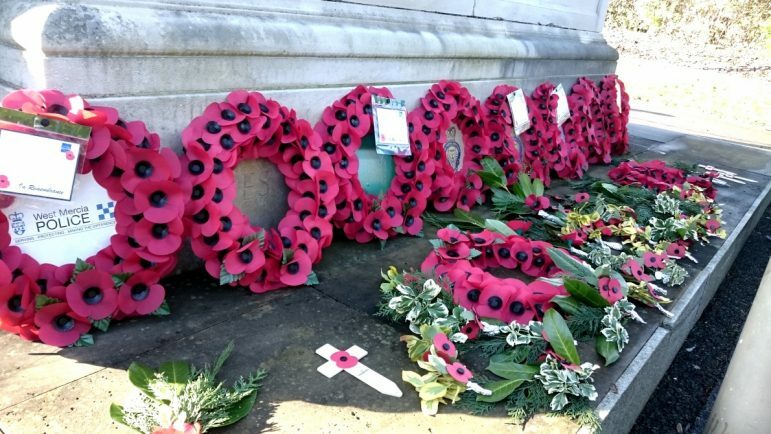 10.45am – Service at War Memorial outside St Stephens Church, followed by wreath laying and a service in the Church. The following roads will be closed to enable the 10.45am service to be uninterrupted. Unicorn Hill from its junction with Hewell Road up the hill, Bates Hill, Church Green West from Unicorn Hill to its junction with Prospect Hill and Church Road from the bus depot up to Church Green West. The closures are expected to be in place from 10.15am to 11.45am. Peace and Beacon lighting ceremony at St Stephen’s Church. 5pm – The Battle’s Over – an evening of drama, poetry and songs from the Great War. 6.40pm – Beacon lighting ceremony. 7.05pm Ringing out for peace with the bells of St Stephen’s. 9.45am – Assemble outside St Matthias’s and St George’s Church, Church Road. 10am – Service in the church. After the service the parade, led by Redditch Sea Cadets, will march to the War Memorial for wreath laying and two minutes silence. 10.30am – Service in Winyates Centre. 11am – Service in Christ Church, Matchborough. From Saturday to Tuesday, November 10-13, there will be a special exhibition marking 100 years since the guns fell silent on the Western Front and also the 100th anniversary of the Royal Air Force. On display will be memorabilia including profiles of the Redditch soldiers killed in World War One, photos, models including coverage of the battles of Passchendaele, Somme, Jutland and the Second Battle of Ypres where the first mass use of poison gas was deployed. It’s at St Philip’s Church in Church Road, Webheath and is open from 10.30am to 5pm and on Sunday from 12.30pm to 5pm entry £2 for adults, £1 for children.